→HTC PM4000 Review – Worth your hard earned money? HTC PM4000 Review – Worth your hard earned money? 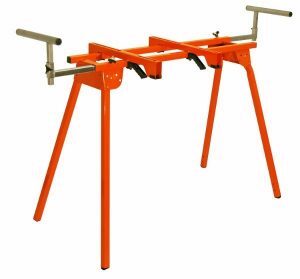 A good miter saw stand can make cross-cutting large pieces of stock down to the sizes you need an easy job. Having a bad miter stand, or worse, no stand can make the job very difficult. 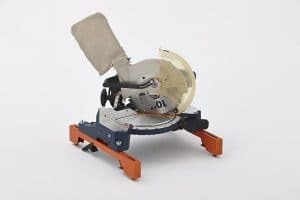 A miter saw stand should offer support for the piece you are cutting as well as a solid base to hold to saw so your only concern is making accurate cuts. The Folding HTC PM4000 Portamate stand has some very good features for the beginning owner as well as the long time handy- man. This review aims to help you decide if it is the right stand for your specific needs. Is the HTC PM4000 Portamate Miter Saw Stand the Right Stand for You? The Portamate stand comes with two support “T’s” to hold both sides of your stock. The outrigger supports can be extended to hold just over 9 feet of stock and are rated to hold just over 500 pounds. Setup of the Portamate proved to be straight forward and simple. In the box you find the supports, legs and hardware to assemble your miter saw table. From unboxing to making my first cut I’d say maybe 45 minutes passed. The pieces for the HTC PM4000 are hollow steel that feels very sturdy, with good welds and very well down powder coating. The phrase, “You Get What You Pay For” comes to mind with this stand. While it is on the cheaper side of most stands you’ll see, it is fairly sturdy and seems to be built very well. It folds up quickly to allow you to move it around your worksite or to store it away. Other stands have more features but this one is a good basic miter saw stand that gets the job done. One of the main functions of a table is to hold your miter saw securely while making cuts. The HTC PM4000 was able to do this for two different saw I own, a 10 inch and a 12 inch. The HTC PM4000 was able to accommodate both with only small adjustments. Probably my favorite feature of the HTC PM4000 is the price. I could buy a more expensive stand but I honestly don’t think it’s worth it for what I need. While I use my miter saw on a lot of projects, I’m not a professional carpenter. I was able to get the PM4000 for just under $80, which is right about where I’d like to be. From the start, I noticed that when extended the T supports weren’t quite square with the cutting surface on my saw. While readjusting the T supports I noticed that clamping them in place led to them going off square. Not a big deal if you are okay with sanding or using putty to fill in any off-center cuts, but, for fine furniture making where precise cuts are needed this will cause a problem. I also noticed when extended all the way out to their 9-foot extension the supports would shake quite a bit during my cut. I was still able to keep the piece I was cutting relatively straight but I can see this causing issues with lighter pieces. The HTC PM4000 Portamate can be found from many online sellers. Below are sellers I think have the product for the best price and offer the fastest shipping. Walmart.com offers free 3-day shipping on the HTC PM4000 and provides in-store pickup. You can also pay around $25 for one-day shipping if you need it quickly. Amazon.com has the Portamate for a very good price and offers free 3-day shipping for Amazon Prime members. If you aren’t a Prime member Amazon will still ship the item free but it will take 5-8 business days, which is still a good deal. I also liked the deal that Shop.com offered on the PM4000. If you aren’t familiar with the site you get money back on purchases that you can then use for other things sold on the site. Shop.com ships anything over $50 for free but could take anywhere between 7-14 days to arrive. While I must say the stand exceeded my expectations at the price point it was at ($65-$80), I felt there were some things it fell short on. Getting and keeping the supports straight and level with my miter saw proved to be a chore. But, the stand is very sturdy and was able to accommodate both of my miter saws without issue. I would call this miter saw stand an entry level or “hobby” stand for either the professional that doesn’t use his miter saw all the time or for the home handyman who needs a stand to help with weekend projects. It’s not a bad stand by any means, it’s just not the best you can buy. It is much cheaper than other stands, but other stands seem to offer a bit more stability and less re-configuring.